Ooh, I'm first. That's cool, cause I'm new lolz. Short Intro : Well, hello there. Not sure what to say really. Boyfriend's the third group I fully invested myself into, which meant I abandoned my previous two lolz. I did a bunch of things. I used to do a bit of translating for a WGM couple for a short while, I make videos to go with my fanfics, I have quite a few lolz, I'm a...dynamic fan lolz. My favourite ship is DongWoo and my favourite song is probably Soulmate and Janus and Iyah and Go Back...and Standing with You, and so on...and my favourite MV is Love Style cause Minwoo looks so damn good in it lolz. And I have a bit of a rambling streak. Sorry. I didn't realise you replied lols, sorry. Yeah. But judging how the twins kept going how they're three months older than Minwoo...;~~~;. I'm at least four months older than Minwoo ;~~~~~~~;. WGM - We Got Married. Yeah, I do know Korean but I'm ~apparently~ not native so haha. Already applied though. I used to like SS501 and U-KISS. Haha, in that order. After a while they did Don't Touch My Girl and I was like um.. okay not my favourite Minwoo hair but his smirk? near the end was cute. So it's just like these two times when I knew them but didn't bother following Boyfriend cause uh...let's see...2011...I think I was following SS501. Not sure @_@. Oh I just checked, I was following U-KISS lolz. I think I just started following U-KISS then and was crazy about 'em, so I didn't bother following other groups, cause as I've said, I can only invest myself in one group at a time. Then U-KISS had some problemssssss and I jumped ship to Boyfriend.......lolz. SS501 reached the end of their contract and I jumped to U-KISS too. I'm not a very loyal fan lolz. Anyway, Boyfriend was I think June?? It was super late. Like, I'm a new fan, but I know everything HAHA. It was so amazing though, I watch Korean variety shows regularly, like Running Man, Infinity Challenge, Happy Together. Basically I love Yoo Jaesuk also so expains lolz. Anyway I watch variety shows also, and sometimes they play music videos at the end of the show. So I'm not sure which show I watched, there was Boyfriend's Obsession playing O_O And I didn't realise cause I seriously didn't know them ever since Don't Touch My Girl, but I just let the song play and checked my other tabs and I really digged the song, so I went back and see, EH? BOYFRIEND? Then I started looking up Obsession and then Janus, and then I just suddenly fell in love lolz. Since June, I swear, I've done almost everything I could to catch up. I have this streak in me, which is why I can only invest myself in one group. I watched all their variety, watched their Jap movie, Jap broadcast, radios, whatever I could find I just watched them all. So I kinda know everything although I'm a "new" fan lolz. Almost like I've been there with them since the start LOLZ. I warned you about my rambling streak ._. Ahhhhhh i see ! It's alright ! I talk a lot too ! It's alright ! It's better to have people going on and on and keep me happy and smiling while reading your replies than to read empty replies you know ? HAHAH awww , i'm sure BOYFRIEND will be happy to hear that you left your other 2 groups and came over and join us ! awww , no worries , all of us here have watched ALL OF BOYFRIEND related shows , MVs , radio shows and so on and so forth(: . Well it's normal to wanna know and get to know our boys better(: . That's why most fangirls said this ; " It's good to marry a fangirl because she most probably knows you better than you know yourself . and you sure knows that she's faithful cause she's been there with you from the start till the day you notices her (: " So , don't feel weird ! Ahhhhh ! You know korean so cool ! I'm still learning:( . Maybe you can give both me and one more bestfriend also from SG a lesson ? (: We could meet up ! Ahhhh ! Good , so i should see more subbed videos updated more frequently after you're recruited i guess ? (: Do your best alright ? I'll support you(: . Well i agree at the part where you said that Minwoo looks so cute AHHH I SWEAR HE MADE ME STAYED SO FAITHFUL TO HIM THAT U HAVE NEVER LOOKED AT OTHER GUYS AFTER KNOWING HIM !!!!!!!! That's the power he gave to keep me go crazy over him 24/7 , forever and ever !!!!! HAHAHAH anyway , please get comfortable with the forum and talk to me more ! I'll reply you once i'm free , i'll be online everyday , just depends on the timing ! HAHAHAH Cause i'm just like our sleepy head silly pig (Minwoo) I sleep like a pig HAHAHAH ! Ahhhhh ! You know korean so cool ! I'm still learning:( . Maybe you can give both me and one more bestfriend also from SG a lesson ? (: We could meet up ! Ahhhh ! Good , so i should see more subbed videos updated more frequently after you're recruited i guess ? (: Do your best alright ? I'll support you(: . anyway , please get comfortable with the forum and talk to me more ! I'll reply you once i'm free , i'll be online everyday , just depends on the timing ! HAHAHAH Cause i'm just like our sleepy head silly pig (Minwoo) I sleep like a pig HAHAHAH ! Lolz, I cut your post a bit cause Idw to make this thread to crowded. Haha, not sure if I'm a burden to the team or not...so we shall see. Uh, I don't have friends that like Boyfriend. Kinda a reason why I ended up on this forum also lolz. I actually didn't put my name here for giveaways but to see who else are in it but okay....? Kinda feel bad for making you spend money though .___.??? And you didn't self-intro, did you? That's not fair :33! Ahhh that's a pity! BOYFRIEND SO MANY CUTEIES HOW COULD THEY NOT LOVE THEM??? HAHAHAH! Don't worry! You've got me to fangirl with! 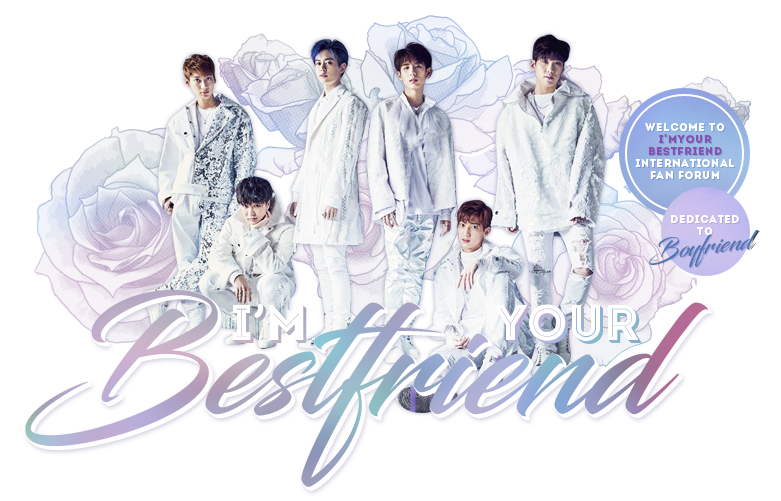 Well the purpose of you filling your name up is so that I could see how many singaporean bestfriends are there in this forum so like if BOYFRIEND comes to Singapore, we can like have projects,like buy gifts and stuff so that BOYFRIEND notices us! If you wanna know more about me, I did a introduction of myself in the introduction sub forum in this forum (: you can go check it out(: and also do an introduction of yourself to us? (; . What do you get confused by? Korean isn't a very complicated language actually. You mean under the Singapore one? Or somewhere else haha. I already did, didn't I? ._.?? HAHAH hopefully i'll be able to get into uni ! Tyou should chek it out too(: . Ahhhh ! LUCKY YOU:( Great ! We can go together next time ! I'm really looking forward to it ! Nice knowing you anyways ! Hey YiJing ! I'm Shannon ! 15 this year , from Chung Cheng High Yishun^^ . My bias is Minwoo too ! Nice to know you too ! Please help gather more Singapore Bestfriends ! And help ask them to join here ! If i get 10 names filled up , i'll be able to make the project happen ! Ahhhh , i feel you ! I'm also learning Korean ! Maybe we can meet up too ! We can learn together ! Ahhhh ! You should write more fanfics ! I read your fanfics it makes me feel so excited ! Gahhhh ! I look forward to meeting you ! Nice to know you ! Thanks for filling up your name ! Hi guys! My name is Jolene, and i'm 17 this year. I've been really inactive in the forum this year because of school, and i really hope i'll be able to get back to 0526subs on a full time basis soon. My bias is Hyunseong, and i've liked boyfriend since their debut! I've been to all their events in Singapore, and was luckily able to get hi-5 passes for both of them. It's alright for being inactive !